"Bali-Hai" is an exceptional family beach home that boasts great Ocean Views, spacious living areas, large decks & a warm & inviting character that will make you feel right at home. Situated on 2 ocean-front lots, your family will be thrilled w/ all this home has to offer including the recently updated kitchen & baths, Elevator serving all levels, hardwood floors, real pine tongue & groove walls, & private access to the beach. The craftsmanship of the wood work throughout this this home is absolutely beautiful. Centrally located close to shopping, dining & area attractions, an ideal choice for a grand Outer Banks Vacation. "Bali-Hai" has features that can be used by those w/ mobility concerns but it is not ADA compliant. 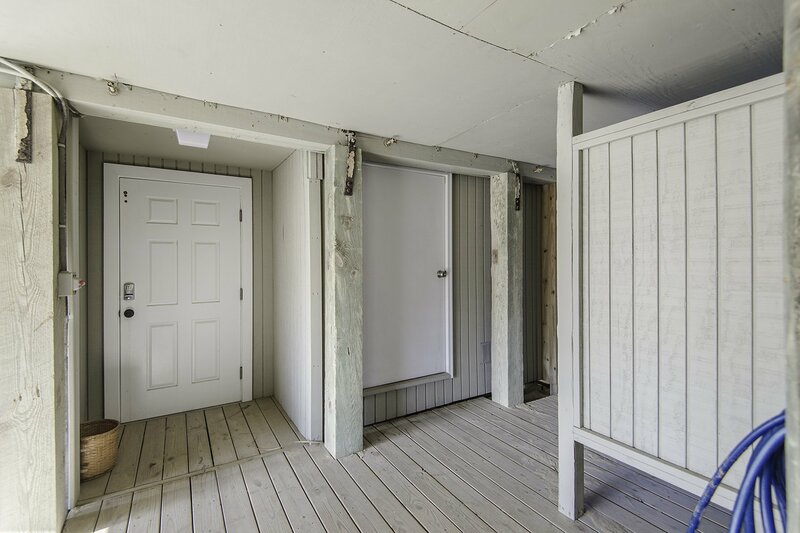 The Elevator, top floor master bedroom & hallways will accommodate a wheelchair but the exterior doors to the decks are 30" wide so access to these areas is limited. Ground Level: Parking for 4 Cars, Steps to Covered Entry, Elevator (36 In x 46 In) to All Levels, & Enclosed Outside Shower. Mid Level: Living Room w/TV, DVD, Ocean Views, Dining, Area, Kitchen w/Bar Seating, 2 Bedrooms w/Queens, Small Den w/Single Daybed & TV, Full Hall Bath, Laundry Area, & Access to Large Sun Deck w/Deck Furniture, Covered Porch w/Gas Grill & Walkway to Beach w/Dune Top Deck & Steps to Sand Path Leading to Beach. Top Level: 3 Bedrooms (1 Oceanfront Master Suite w/King, TV, Full Bath w/Shower Only (3.5 Inch Lip) & Grab Bars, Endless Ocean Views, & Private Sun Deck, 1 w/King, 1 w/3 Singles & TV), Full Hall Bath w/Shower (6 Inch Lip). 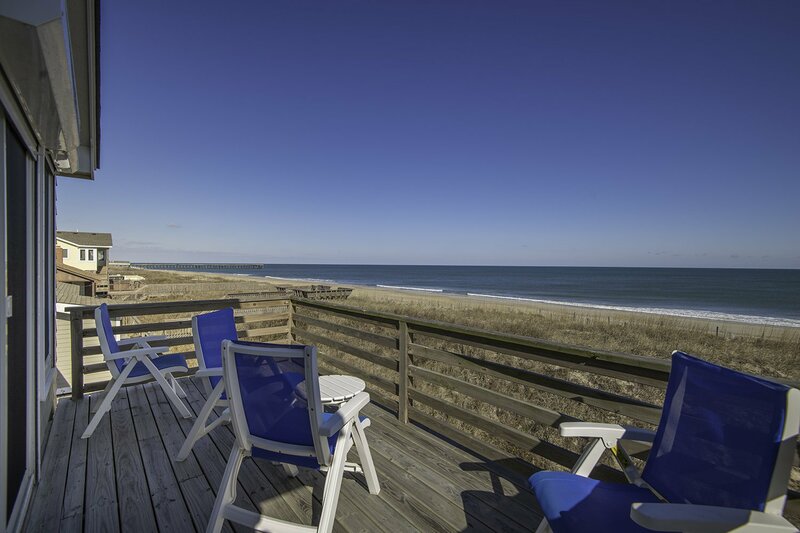 Features include: C/AC & Heat, Washer/Dryer, Dishwasher, Microwave, Phone, TVs, DVDs, Wireless Internet, Deck Furniture, & Private Walkway to Beach. No Pets. This is a Non-Smoking Unit. This lovely home met our family's needs more than any other vacation rental that we have stayed in beginning in the early 1970's. Thank you!! I've visited the OBX for over 20 years, but I've never seen a finer beach cottage. I look forward to renting Bali-Hai for years to come! It is so well appointed and kept, and the owners obviously love the house, which is evident in the decor. Place is beautiful. Worked well for our large group. We truly loved the house, it was a perfect place for our family to gather. Tons of character in your home...we really enjoyed staying. We had 11 in our party and there was plenty of room. Really enjoyed the back deck. Loved all of the pictures throughout. Deck furniture very comfortable. Thank you for WiFi. Beds very comfortable. Beautiful home! We loved the master bedroom/bath/deck, the huge main deck and so much else.